With consecutive seasons of consistent high-end yield and fiber quality performance across the Southwest, DP 1646 B2XF has become the Deltapine® variety by which others are being measured. The 2018 growing season showed why growers again will turn to this variety for planting in 2019. In the lower Rio Grande Valley near Weslaco, Texas, Hans Hovda has planted DP 1646 B2XF for three seasons in a row. Consistent performance keeps him coming back. “For us, DP 1646 B2XF has been very adaptable to different soil types, and that is important because we have fields with really heavy clay-type soils and some fields with really light, alluvial soils,” said Hovda, who farms on 40-inch rows with all fields furrow irrigated. Last season, Hovda began planting cotton in late February, into dry, hot conditions that remained until June, when upwards of 20 inches of rain dumped onto late-stage cotton. In a test plot planted late behind a spinach crop, DP 1646 B2XF averaged over 4.5 bales per acre. In other fields, which did not drain well and where boll rot took away from the yield potential, DP 1646 B2XF consistently made 2.5 bales per acre, according to Hovda. DP 1646 B2XF hung in through the dry period and responded well to the rainfall late in the season. The results in 2018 were, once again, consistently good on Hovda’s farm. 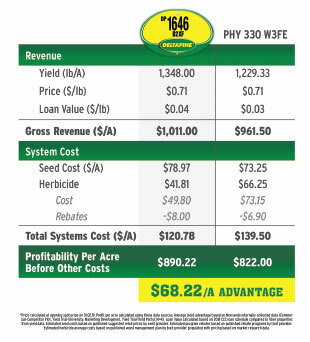 In 2019, Hovda will continue to plant and try other varieties, but he says 90 percent of his acres will be planted to DP 1646 B2XF, an increase from last season.